“We’re not blocking traffic, we ARE traffic” is the slogan of Hamburg’s Critical Mass movement. Critical Mass is held in cities worldwide on the last Friday of every month, including Oxford, but in Hamburg it attracts large numbers. Friday 28th February was no exception; despite being very cold over 1,000 people turned up. There was almost every kind of bike imaginable; tandem, road, city, vintage, folding, race, mountain, etc; and some of them were lifted into the air at the start amid ringing bells and hooting of horns. And why did those people brave the cold February evening? 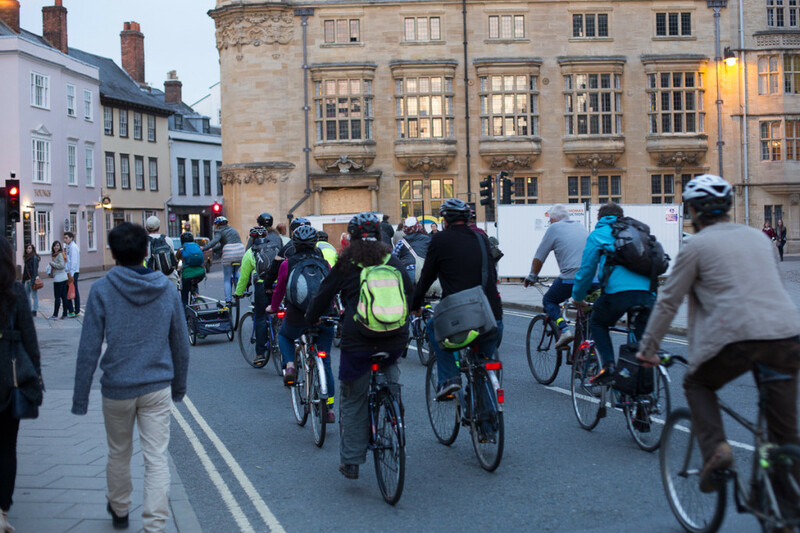 For the same reason we take part in Critical Mass in Oxford: because we care about cycling and we want to spread the message that cyclists are traffic. Let’s hope that like Hamburg’s up-and-coming Green Network we can see a more cycling-friendly future for Oxford and maybe even a bigger turn-out at the next local Critical Mass!